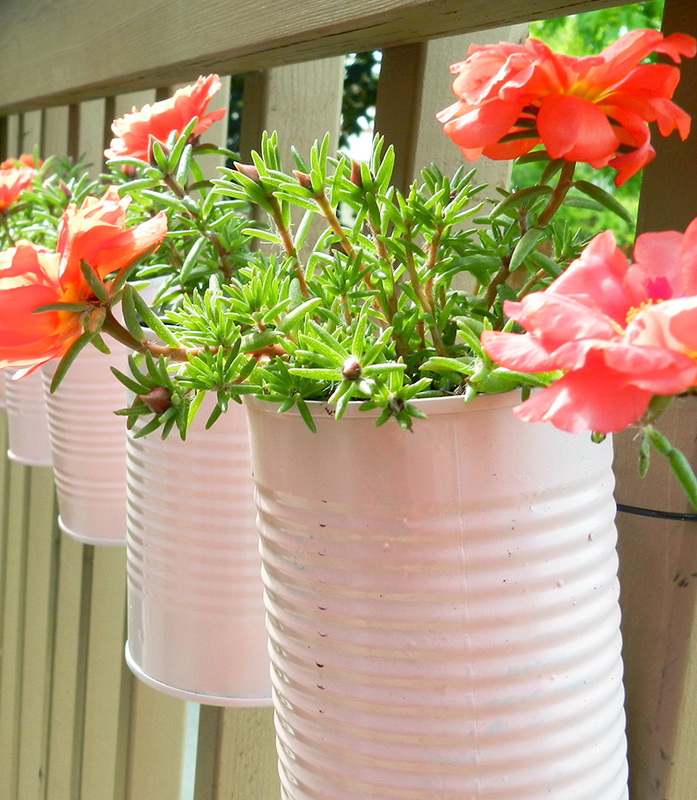 Summer is here and I'm adding more color and flowers to my deck using vertical planters made out of recycled tin cans! Wooohoo.... I feel pretty good about using recycled materials for this project. It's easier on the wallet. These are really small planters and they are secured to the rails with bailing wire, so I had to go small with the plants. The Moss Rose works perfectly for me! Continue reading to find out how to recycle tin cans into beautiful flower planters! Step 1: Fill cans 3/4 full of water and freeze. While water is still frozen, use a nail and hammer to pound two holes 1/2 inch apart on the side of the can. It works better if you place the holes about near the top. These holes are for the bailing wire that you will attach later. You don't have to freeze water in the cans to do this, but I find it holds the shape of the cans better. If you feel more comfortable using a drill then have at it! 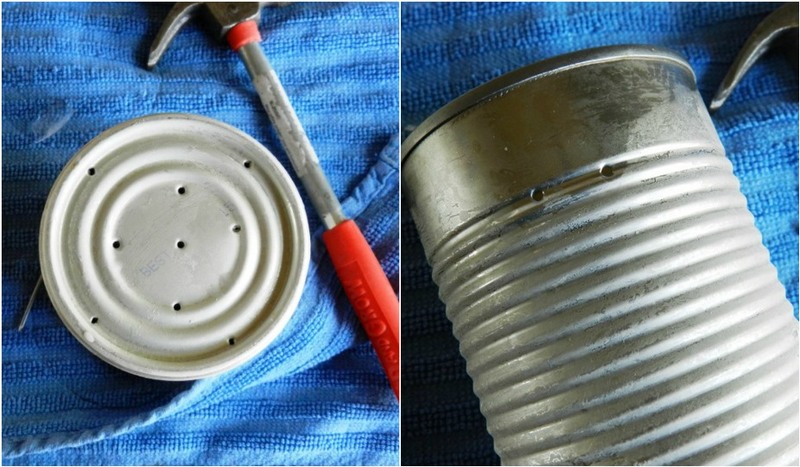 Step 2: Pound several holes in the bottom of the can to create drainage holes for your little planters. You don't have to be fancy with this. Just put some holes in there. Step 3: Spray paint your cans a pretty color that complements the flowers or plants you will be putting in them. I used Krylon Indoor/Outdoor Spay Paint in ballet slipper color- cool name! Step 4: Cut sections of bailing wire 4-6 inches long, depending on how wide the rails of your deck are. Slightly bend the wire and stick each end through a hole. Pull through as shown in the photo below. 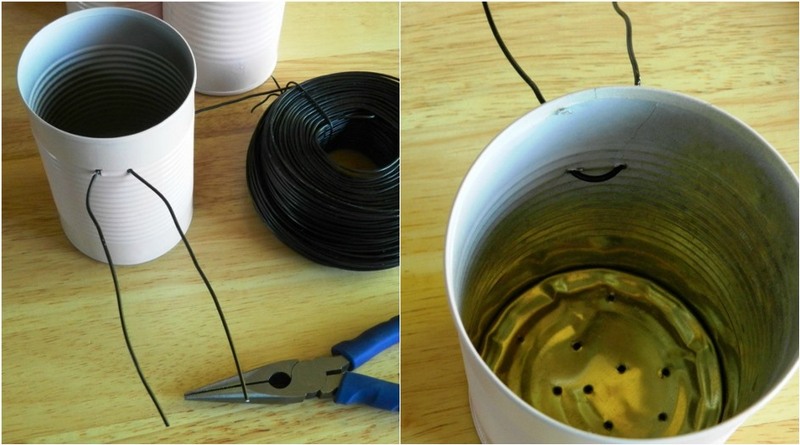 Make sure to cut your wire long enough to thread through the side holes of the cans and wrap around the rails. Step 5: This is the fun part..... planting! 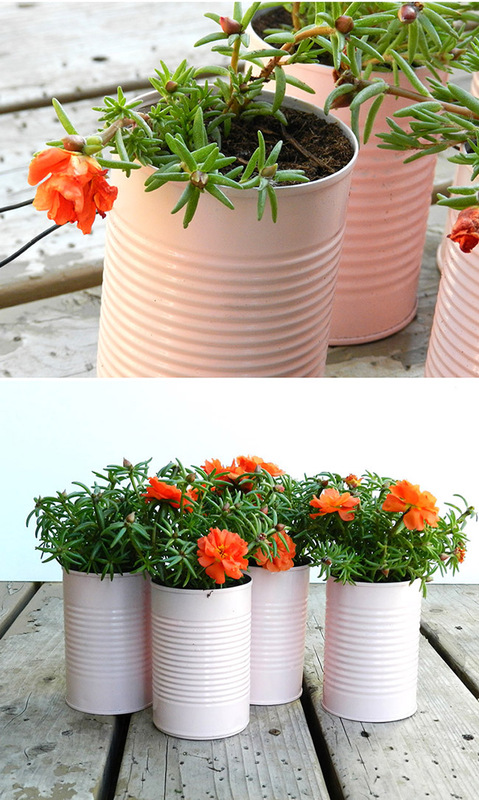 Put a little potting soil in the bottom of each can, place your plants in and fill the the rest with more soil. Step 6: Now it's time to make these planters vertical. 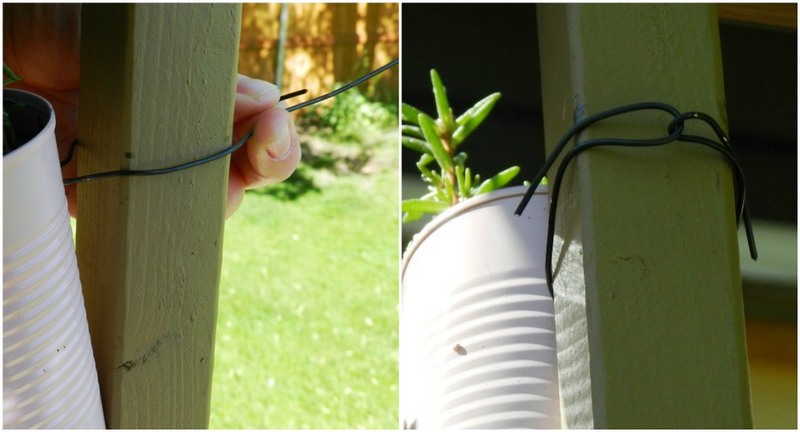 Choose a place on your deck that gets the appropriate amount of sunlight for your plants and attach the cans to the rails by wrapping the wire around the back of the rail and twisting to secure. You have to twist the wire pretty tight to get these to stay up. A pair of pliers comes in handy here. Beautiful & yea for recycling!! I don't have deck rails but I may try this on my fence :-) Thanks! Thanks and yes, recycling is the best! This would look nice on a fence too. good luck! great idea for a pop of color. 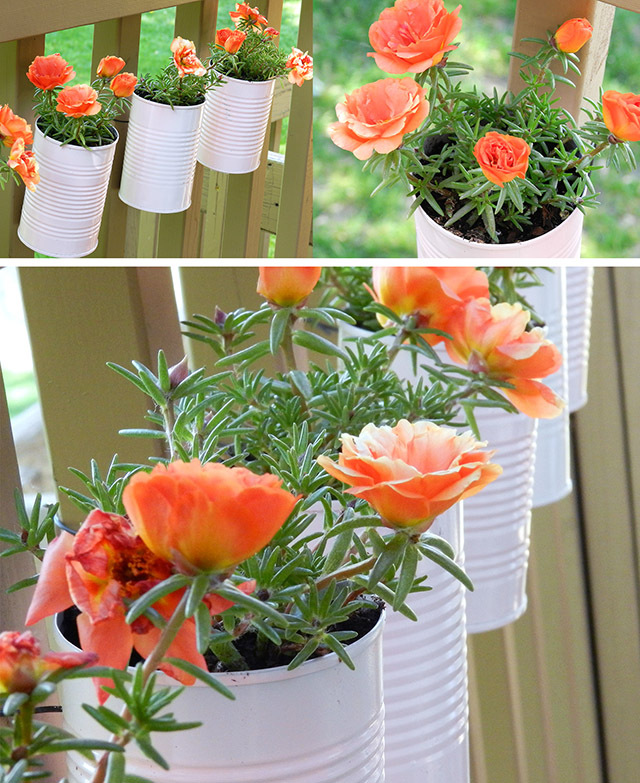 i did something like this on my garage wall, but it's with these hooks that are specifically for terra cotta pots. definitely brings some color to the space. enjoy! Love these! I just bought this very plant yesterday...I think I may skip the wire and make myself a tin can centerpiece! Thanks for the inspiration! Thank you for linking to Whimsy Wednesday last week! I featured you in my post today! So cute! Βeautiful and easy diy!Thank you!